HIPAA compliance is getting more complicated, and more essential. Is your A/R management or collection agency doing anything to protect you from violations of HIPAA, FDCPA, HITECH, and TCPA? If not, you may be liable for drastic penalties. HIPAA: How to protect yourself and your practice | Medical Economics. Collections, both in-house and outsourced, are governed by federal, state, and sometimes local laws and regulations. In many cases, businesses and medical practices are governed by the same laws as are collection agencies. Ignorance of the laws and regulations that govern your activity is never an excuse, nor a defense, for breaking them. For example: Calling to collect on an account at an odd hour or disclosing to a third party that a person owes your business/practice money are just a couple of the collection practices that can cause serious repercussions. Become familiar with the Fair Debt Collection Practices Act, the Telephone Consumer Protection Act, HIPAA (for medical and dental practices), and any state and local regulations pertaining to your location, or partner with someone who can help you remain compliant. For more information on staying compliant in following-up on slow-pay and delinquent accounts, contact me through the form below or follow this blog for regular updates. It is always important to ask questions, especially if you are not 100% certain of the subject matter you are discussing. This is even more important when selecting a company to recover your late payments and call upon people that are delinquent on their accounts. It is paramount to ensure your company of choice is expert in their field. Today with the ever changing Federal and State regulations, it is more important now than ever to ask questions first before you have to answer for shortcuts or missteps that could result in hefty fines for lack of compliance with the letter of the law. The next time you talk to a potential collection or debt agency be sure to have the following questions close by so you are not hit with Federal and State regulations later. 1. Is your company compliant with TCPA, HIPAA and familiar with state laws regarding compliancy? Yes. 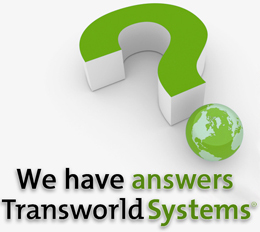 In fact, Transworld Systems is compliant in all 50 states as well as having a Hold Harmless Statement in our agreement with clients. Yes. We perform background checks on collectors in ALL states. Rules governing cell phones are complex and change frequently. You want a collections agency that is willing to give you a Hold Harmless Agreement. 4. What is a Hold Harmless Agreement? Simply put, a Hold Harmless Agreement is an agreement or contract in which one party agrees to hold the other free from the responsibility for any liability or damage that might arise out of the transaction involved. 5. Do you know what PHI is? Yes. PHI is Protected Healthcare Information. It includes any information about health status, provision of healthcare and payment for healthcare that can be linked to an individual. Be sure the company you choose ensures the security of that information. 6. Is your company licensed to collect in all states? Yes. If you are billing regional, national or transient customers, it is important that your collections resource can legally collect in the states where your debtors reside. Contact me for more ways to know if your collection agency will keep you protected from liability and potential penalty.